Since I branched out into lifestyle blogging, I have been doing a lot of book reviews, and this year I received a good number of books to put into my Holiday Gift Guide. I like that because I am an avid reader, I have always been one to devour a good book and to want to read more well written books as much as possible. So this year the Holiday Gift Guide will be having more books. 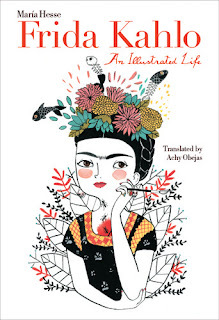 This book, Frida Kahlo: An Illustrated Life, was written by María Hesse and translated by Achy Obejas. It is essentially a biographical look at the life of iconic artist Frida Kahlo written as an illustrated look at her life and how she painted, suffered and went through her life's journey in a graphic novel form. It is written in the first-person and illustrated with striking reimaginings of her famous paintings. This book would make a great gift for anyone who is a lover of her artwork and who loves art in general. The story is interesting too. I would not really recommend this for children as some of the illustrations are a bit graphic in nature. This would make an interesting coffee table book too. Frida Kahlo: An Illustrated Life come in hardcover binding and is 152 pages. Originally it was written by María Hesse and was translated by Achy Obejas. This would make a wonderful gift for anyone. It can be purchased online at the University of Texas bookstore: https://utpress.utexas.edu. Like UT Press on Facebook: https://www.facebook.com/utexaspress/; Follow UT Press on Twitter: @UTexasPress; Follow UT Press on Instagram: https://www.instagram.com/utexaspress/; Follow UT Press on Pinterest: https://www.pinterest.com/utpress/; Follow UT Press on YouTube: https://www.youtube.com/c/utexaspress and Follow UT Press on Tumblr: http://utexaspress.tumblr.com/.